A natural pond can be a thing of beauty, full of fish and surrounded by turtles and frogs, covered with delicate aquatic flowers and plants. Building a pond is not as difficult as you may think and there are a few step-by-step instructions to follow if you want to build a pond. You don't need a lot of space to have a backyard pond in fact many people are able to create interesting water features in very small spaces and thanks to the new supply of inexpensive pond skimmers, filters and more efficient pumps and water conditioners it has made owning a pond easier than ever. There is nothing like a pond! What else can simultaneously increase your aesthetic pleasure, offer recreational opportunities, help the environment, and increase the value of your land? This is the recognized standard on ponds, now expanded to include a comprehensive guide to living happily with your completed pond and keeping it perpetually healthy. Here is everything you need to know about planning, digging, sculpting, and maintaining your pond. 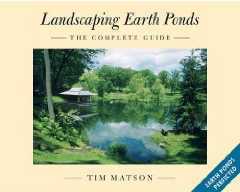 This book is a good start to building your own pond. I would suggest it as a inexpensive first step to pond building. What I learned in my experience was there is just too much to consider when you want a high quality pond. I used a professional biologist to design my pond and got terrific results. I was happy I knew the basics from this book so I could speak somewhat intelligently with the fishery biologist. After investing tens of thousands of dollars, I learned that the small amount I spent on this book and the professional advice was well worth it. I was so happy I got a nice clear fishing and swimming pond instead of a muddy mess or one that was weed infested. 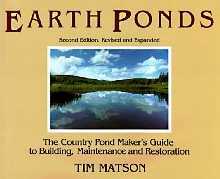 Matson designed this book to serve as a companion to his Earth Ponds: The Country Pond Maker's Guide to Building, Maintenance and Restoration (Countryman, 1991) by exploring new topics in depth and providing additional bibliographies and lists of suppliers. Topics include pond building and maintenance, activities and uses (including ice skating, fishing, beach building, hydro power, and pond-side structures), ways to attract wildlife and control pests, and small water-lily or goldfish ponds. Resource lists provide addresses and phone numbers, with occasional annotations. 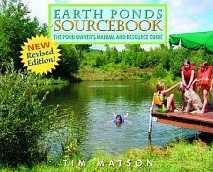 Matson balances his enthusiasm for ponds with frequent warnings about legal, structural, and ecological pitfalls?information that may well save readers from costly mistakes. More than two hundred illustrated entries distill the latest information on ponds into a unique and definitive companion for pond owners and builders. Absolutely the last word in pond or small lake creation and maintenance. For both the amateur and professional. Well worth the steep price. Lake and Pond Management by Steve McComas is an excellent reference for cooperative extension advisors, soil and water conservation district staff, lake association representatives, and other watershed managers. Licensed commercial pesticide applicators who are considering broadening their credentials to the aquatic pest control category would also find this Guidebook a valuable addition to their reference libraries. As a retired university farm advisor and riverfront landowner, I found this book highly educational - and well worth the price. Natural swimming pools rely on the correct balance of living plants and micro-organisms to clean and purify the water. They are easy and less costly to maintain than chemical pools. Chlorine and other common pool chemicals that are hazardous to human health are not used. Natural pools are safe places for children to play and birds to drink, and are a dramatic example of ecological design, combining the natural and man-made worlds while creating beauty. These pools offer enjoyment not only in the warm months, but during winter, when they can be used for ice skating. Often the focal point of a garden, a natural swimming pool blends into the environment, flowing into the surroundings with plants and rocks. It reflects the changing seasons and enhances the environment naturally. 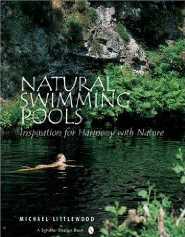 This book is a necessary resource for people who consider a natural swimming pool. It shows how the natural system works to provide environmental, health, and safety benefits. Drawings, diagrams, and charts help explain their planning, design, biology, materials, construction, planting, and maintenance. Over 300 beautiful color photographs of natural pools will inspire your own water garden, where you can swim in harmony with nature. Whether it is a small container of water on a deck or patio serving as home to a few plants and water creatures or a more elaborate mix of waterfalls, fountains, rockwork, and lighting, the water garden can be a lovely, spirit-soothing addition to one s property a place to unwind, relax, and escape the cares of the world. But while water has been a prominent feature in garden designs for thousands of years, it is only recently with the availability of preformed kits at the local home improvement center that installing a beautiful water garden has become a feasible undertaking for the average homeowner. And now, with the extremely clear and complete instructions in this practical, hands-on guide, a backyard water garden is easier than ever to build and maintain. This is a true bible on the subject with comprehensive information on everything from choosing the right site and selecting aquatic plants and fish to pond management and problem solving. The pages are crammed with specifics about pond biology and chemistry, beneficial bacteria, fish health, nuisance algae, and electrical and child safety all that is necessary to duplicate the sights, sounds, and sanctuary of a babbling brook, splashing fountain, or cascading waterfall right in the backyard. An updated, expanded edition of Creative Homeowner's comprehensive guide to water gardens, Complete Guide to Water Gardens, Ponds & Fountains provides essential information on designing and installing all types of home water gardens, from naturalistic to formal, plus fountains, waterfalls, streams, and bog gardens. Readers will learn how to construct each of these structures, as well as how to design bridges and stepping-stones. Special sections on aquatic plants, fish, and other pond inhabitants bring life to these essential garden features. Beautifully illustrated with dozens of inspiring landscape photographs, plus step-by-step sequences and instructions, the book shows readers all they need to know to create and maintain the water garden of their dreams. Well-known author Leslie Geddes-Brown traces the history of the decorative use of water in the garden, from the tinkling fountains of ancient Persian enclosures to the most avant-garde creations by twenty-first century designers. Thematic chapters present water gardens of all types, from Islamic and Oriental to romantic and formal, and from landscape gardens to town gardens. The book includes the work of such celebrated designers as Harold Peto, Geoffrey Jellicoe, Helen Dillon and Derek Jarman, and such revered gardens as Stourhead, Giverny and the Villa d Este. Each chapter begins with a brief introduction followed by three or four beautifully illustrated features on specific gardens around the globe. The book concludes with an international plant directory, a guide to water gardens open to the public and full contact details of all the contemporary designers featured, making this an essential, inspirational reference for garden lovers everywhere. Water gardens are often the most beautiful gardens around any home. The blending of water and earth creates a harmonious balance that relaxes the body and mind as it inspires the soul. Yet water gardens can be intimidating, too. At first glance they may seem to be complicated places filled with unfamiliar plants with unusual needs. Happily, aquatic plants can be simpler to care for than they first appear. This bulletin tells you everything you need to know to select and care for water plants with minimum fuss and maintenance. Whether you want delicate floating plants, exotic water lilies, or carnivorous bog dwellers, you'll find here suitable choices for your taste and climate conditions. The beautiful yet undemanding aquatic plants featured in this bulletin are sure to brighten your spirits as well as your garden for years to come. This complete illustrated guide to water gardens will help anyone create a beautiful backyard. Water Gardens: Pools, Streams & Fountains Is A Better Homes And Gardens how-to manual packed with all the reader needs to know about adding a water feature to one's garden. Chapters cover how to design and plan a water feature, including choosing the right materials and arranging a proper water source, electrical source, and usage of pumps; constructing an indoor or outdoor water garden; enhancing a water garden with seating, paths, decks, lighting, or other features; maintaining a water garden; ideal plants and animals for a water garden, and much more. Methodical instructions and full-color photographs on every page make Water Gardens simplicity itself to use. Highly recommended for anyone interested in adding a water garden to their home. Expertly written and illustrated throughout with color photos and helpful diagrams, this guide describes both traditional and modern techniques for creating a water garden. From streams, waterfalls, and fountains to self-contained features and bog gardens, every form receives in-depth coverage that is easy-to-follow. There are suggestions for siting, design, and construction; detailed assistance on stocking ponds and pools with fish and flowers; and invaluable advice on plant propagation, care, maintenance, and common problems. An extensive directory of aquatic plants covers such favorites as water lilies; floating plants (among them the beautiful, delicate water hyacinth); and many more. People all around the world enjoy the hobby of gardening. They love planting tiny seeds in the soil and watching them sprout into mature plants. Gardening isn t just for adults, however. Kids can plan, create, and maintain their own gardens, too. Gardening for Kids is rich with ideas and instructions for making water gardens, flower gardens, vegetable gardens, perennial gardens, butterfly gardens, and landscape designs. Everyone loves a garden filled with bright colors, soft textures, and lovely smells. Add a little water to the mix and you have the perfect spot to relax and enjoy the best of nature. Relaxing by your water garden is the end of a long but rewarding process. Follow these step-by-step instructions for finding the best spot in your yard for a healthy water garden, designing and digging it, choosing water flowers, and adding fish. You can even build a toad house to attract wild visitors to your backyard. When all the designing, digging, lining, planting and stocking is done, you can sit in your own private oasis and enjoy nature s gorgeous bounty. Color, movement, scent it all adds up to life! Throughout history, water has been a versatile and vital resource for the garden. It was the essential element in the earliest gardens of the and Near East. And today water provides settings and opportunities for an exciting combination of plants and architectural ornament. This volume, with specially commissioned photography by Hugh Palmer, illustrates and discusses both grand and modest water gardens to be found throughout the world, including the Islamic masterpieces of Granada and Kashmir and the gardens of Kyoto in Japan. In Europe and America all the principal schools of garden design - Mannerist, Classical and Landscape invite the reader to share their delights. The ingenuity of the Italian garden is captured in stunning views, as are the grand vistas of Versailles, English landscaping, the smaller-scale pleasures of stream and pond gardens, and the finest gardens and designs by Roberto Burle Marx. Details and close-ups are included throughout, as are examples of the variety of water features that have embellished gardens. A section on arrangements to suit modern gardens, and listings of major water gardens worldwide complete the book. "The Water Garden" is not only a work to stimulate the gardener but also a sumptuous tribute to a great tradition which unites some of the most lavish and beautiful garden schemes ever devised. George Plumptre is a writer, joumalist and garden specialist. His many works include "Garden Ornament" (Thames and Hudson, 1989). Hugh Palmer has contributed photographs to numerous books, including "Garden Ornament, Trellis" (1991) and "The Formal Garden" (1992), all from Thames and Hudson. Complete Guide to Water Gardens is a comprehensive guide to designing and installing all types of home water gardens, from naturalistic to formal. Readers will learn about site selection and construction materials and methods. They will receive information on pumps, filters, lighting, and other accessories. The book also explains how to install streams, waterfalls, fountains, and statues, as well as how to design bridges and stepping-stones. Complete Guide to Water Gardens also includes information on maintaining water quality and selecting fish and plants. Beautifully illustrated, including step-by-step sequences and instructions, this book shows readers all they need to know in order to create and maintain the water garden of their dreams. Water is a soothing and delightful addition to any garden, and water features streams, waterfalls, and bog gardens continue to be popular design elements in the modern garden. And now, gardeners finally have a practical and handy place to turn for information about water garden plants. In the Timber Press Pocket Guide to Water Garden Plants, gardening gurus Greg and Sue Speichert provide information on a full range of plants that can be used in ponds and wet soils, from the widely popular waterlilies and lotuses to the often-overlooked submerged, floating, and bog plants. The newest edition in the popular pocket guide series focuses on 300 of the best plants for use in large and small water gardens. Each description includes detailed information on choosing, planting, and caring for plants. Notes on cultivation address the question of how much water each plant needs to grow and provide information on cold tolerance and how to overwinter plants. Suggestions for use in the landscape offer design ideas for gardeners of all levels. Water gardening is making a big splash in today's landscapes. Called the fastest-growing part of the landscape industry today, the installation of water features in the landscape is a multi-billion dollar market. It's easy to see why. Splashing fountains make hot days seem a bit cooler. Basins of water reflect the blue sky, puffy clouds, and colorful fall leaves. Naturalistic ponds and waterfalls attract birds and butterflies to backyards. And tiny tabletop fountains offer soothing sounds that drown out neighborhood noise. Water Garden Idea Book brings these ideas to life, providing more than 300 photos of all types of water features-with tips for design and placement so that they become striking focal points or soothing and subtle additions for any setting. From ponds and streams to pools and water stairs, fountains, containers, and bubbling urns, Water Garden Idea Book has it all. Special emphasis is given to siting all types of water features and how to install a water feature yourself. Extensive resource list is included. From the publishers of Aquascape Lifestyles magazine comes a new book, perfect for water garden lovers everywhere, Water Garden Lifestyles. This new coffee table book will serve as the centerpiece in anyone s living room with hundreds of gorgeous, vivid photographs, as well as beautiful, inspiring words that will spark the interest of every water lover. Whether you re thinking about getting a water garden or are in love with your backyard paradise, you'll flip over the design and style of this sleek, hard-covered masterpiece. The 110-page book features water gardens from across North America, built using the all natural, ecosystem method. Pond owners will be invigorated when they check out the full-color photos and decide that they too need a bridge, deck, or gazebo. Buy one for yourself, or get one as a gift for a fellow water gardener. From ancient bathtubs stocked with goldfish to larger ponds complete with stream and waterfall, water gardens provide both a satisfying challenge to the amateur landscaper and a peaceful corner for the contemplative gardener. This guide offers practical advice on pond design and construction, management and maintenance, containers, and the intriguing history of this increasingly popular backyard pursuit. No one can deny the power and attraction of water features. And it's never been easier for gardeners to add the sparkle and serenity of water to their own landscapes. Garden centers and flower shows throughout North America provide both the tools and the inspiration; this book will give readers the know-how. Projects range from simple to more advanced. Readers can choose among a classic wall-mounted fountain spout, a traditional or contemporary cascade and garden pond, an authentic Japanese-style bamboo water pump, witty water sculptures, and more. With 16 projects in all, this book has something to offer all tastes, budgets, and abilities. Each project is accompanied by clear, step-by-step photographs and easy-to-follow instructions, plus helpful tips and techniques. Also included is a list of tools and materials. Whether readers imagine a container bog garden, a romantic millstone fountain, or a cascade, this book will help them make it a reality. The Xeriscape Plant Guide is a full-color, comprehensive resource for more than 100 low-water-use plants that bring color, beauty and utility to your landscape. This is the Bible on plants for water-wise gardens! With continued national concern over water use, Xeriscape gardens are a sensible option for today and tomorrow. Published in cooperation with Denver Water and the American Water Works Association, and reviewed by professional horticulturalists and landscapers, this fully illustrated reference offers complete information on low-water-use trees and shrubs, annuals and shade plants. These plants were chosen for their ability to thrive in tough conditions, for their low water usage and for their potential to add beauty and diversity to any landscape. Whether you have a small patio or terrace, city lot or a bit of acreage, there is more than enough variety in these pages to turn your garden into a place of beauty. Xeriscape can be considered water-smart gardening or environmentally friendly planting, but the main theory behind it is to grow plants that thrive in our specific regions and soils. Inside the pages of the Xeriscape Plant Guide, you will find a vast array of plants ideally suited for gardens of North America, both familiar and less recognizable, that require minimal supplemental irrigation, that can cope with fluctuations in temperature, and that resist disease and pests. All the plants in this book are depicted by full-color photographs throughout the seasons, and several garden design possibilities are shown. Botanical illustrations-literally the science of horticulture-add a new dimension, as each artist provides a unique rendering that focuses on the personality of each plant. Water forms the soul of a garden. A quiet pond, a babbling brook, or a dramatic pool can make a garden unique. To achieve such beauty, however, requires careful planning and design. Using over 150 brilliant color photographs, this splendid and inspiring book presents the variety of possibilities for using water in the garden. The informative and enjoyable text provides helpful planning details, including advice on waterproofing, the shore formation, attractive plantings, even fish. Planning and building any kind of water garden is not only fun, it greatly enriches the joy that is found in one's own backyard garden. Celebrated designer Keith Davitt brings the delights of the water garden within reach of everyone in Water Features for Small Gardens. With a clear eye to design, construction, materials, and maintenance, Davitt offers alternatives for every style of garden and every budget. Detailed case studies depict actual gardens progressing from the planning stage to planting, and the author shows step by step how such features are created using only modest building skills. Types of water gardens discussed include: natural, formal, and informal pools; raised and in-ground formal fountains; wall fountains; streams and waterfalls; and bog and tub gardens. Heavily illustrated and packed with practical information, Water Features for Small Gardens is a must for any gardener seeking to bring his or her garden to the next level. Whether you want a small feature or a series of waterfalls, this practical and extensive guide provides a host of inspirational ideas for using water in your garden.